It is believed to be a world first: a fully functioning greenhouse on wheels that plugs in much like an RV and that could offer up solutions to some of urban farming’s biggest challenges. The mobile greenhouse prototype, which goes by the name GrOwING GREEN, was born of a collaboration between architecture students at Ball State University and Butler University’s Center for Urban Ecology (CUE). It has already been recognized by the American Institute of Architects with a state award for excellence in architecture. Tim and his students, who have worked on four other projects in support of urban farming, had previously created a classroom using a shipping container and recycled components for the CUE Farm in Indianapolis. When CUE received a grant to do some improvements to the farm, they turned once again to the architecture professor and his students. Why a mobile greenhouse, one may ask? It turns out necessity is often the mother of invention and the CUE farming site happens to be on a floodplain. For this reason the law doesn’t allow permanent structures on the site. So, Tim explains, the initial incentive for mobility was part of figuring out a way to build a facility that was not permanent. The structure is legal because it is mobile and therefore viewed as a temporary structure, falling into a different category in terms of the restrictions imposed by the building department. The mobility aspect enabled Timothy and his students to stage the project at Ball State University, in Muncie, Indiana and then deliver it to the site at Butler University – about an hour and 15 minute drive away. He points out how mobility would allow the greenhouse facilities to be shared between small urban farms. Another potential benefit is its use as a teaching tool to create awareness of healthy eating and lifestyle. 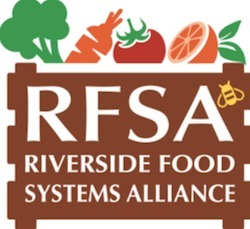 The community is invited to the farm where the facilities they’ve built serve as demonstration projects to extend the discussion of sustainable farming and architecture. The mobile greenhouse could make community engagement more robust as you can literally take the farm out into the community. 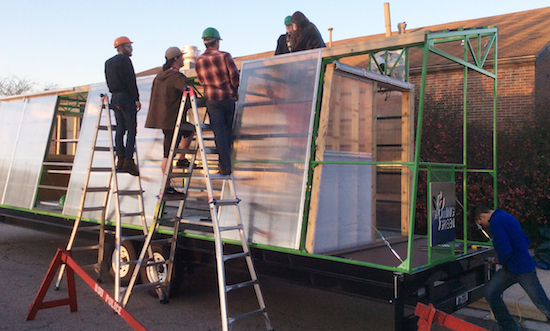 Ball State architecture students building the GrOwING GREEN mobile greenhouse. 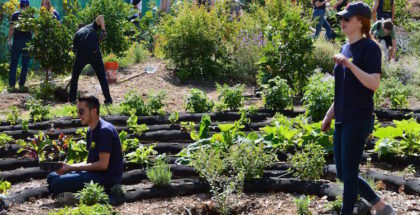 GrOwING GREEN was born of a collaboration between architecture students at Ball State University and Butler University’s Center for Urban Ecology (CUE). Photo credit: Timothy Gray. The greenhouse cost $40,000 to build, with some materials being donated by community and industry partners and students donating their labor. A professional electrician installed the electrical systems and Butler University provided facilities for installation of the irrigation system. Tim says that if it were to be produced in quantity, costs could be kept down once manufacture was centralized and the mobility would allow transportation and delivery to sites throughout the region. With many urban farms situated on marginal properties that may have easements and power lines running through them, and where code restrictions makes building permanent facilities difficult or impossible, the mobility allows the structures to fall under a different area and code, making them legal. “I call that building between the seams of the building code,” says Timothy. Another advantage is that if the farm must move – a prospect that is not uncommon for those farming on borrowed urban land and temporary sites – the facilities can then move with the farm and all is not lost. “I’ve called these projects that we’ve done – all five of them – ‘insurgent architectures’ because they’re small interventions that can make a big difference and they sort of nest in the seams between these building codes.” He points out that building codes can create hurdles that make it very difficult, if not impossible, for small farmers to get any traction, adding that farming is hard enough work without farmers having to deal with all the intricacies of the building codes. The temporary structure offers them a way to do things legally while avoiding restrictive red tape. The greenhouse, which is built on a custom-made trailer, measures 32 feet long by eight feet wide, is about 10 feet high and tapers down to about 8 feet at the low side. 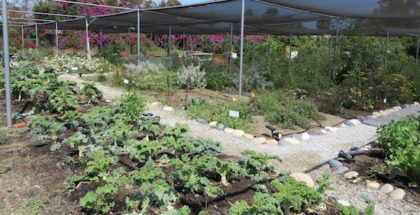 It has an irrigation system just like a conventional greenhouse. “You just have to unhook it – it sort of plugs in like an RV,” says Timothy, who hauled it the 60 or so miles between Muncie and Indianapolis with his Ford F150, demonstrating that it doesn’t take a special truck to transport it. In building the greenhouse they minimized the use of any material that would deteriorate over time. The steel frame is powder-coated and they decked the trailer with a composite recycled wood product that is designed to hold up well when it’s wet and the demisting system is operating. Instead of chemically treated wood, they used naturally resistant cedar, as well as wood from a local Indiana business that uses a heat process to make it decay-resistant. The irrigation system runs on a hose hook-up and a pressure regulator on the inside of the greenhouse limits the hose pressure to 40 PSI. The irrigation system doesn’t have any pumps, running entirely off the hose pressure. There are four different irrigation zones throughout the greenhouse that can deliver more or less water, depending on the needs of the plants. For passive ventilation there are two big south-facing windows and four high windows that face north. The windows are heat sensitive, opening and closing on their own with no assistance. There is a heat thermostat so that when it gets too hot, the fans will kick in. For added temperature regulation, there is also an air conditioner and heater that run off electricity. Designed for flexibility, Tim says that just about anything can be grown in the greenhouse. For this reason the shelving system is easily adjustable; shelves can be moved up and down, or even be removed for plant starts that need to grow a little taller. CUE farm manager, Tim Dorsey, grows a large diversity of crops on the farm and starts are grown almost all year round. For most of the crops, when plants reach a certain point, they are taken outside for a few hours a day and then brought back in. This is done until the root system is a little bit more established, before planting them in the ground. To facilitate this process, a ramp off the back allows plants to be easily wheeled out in a cart. The exterior is made of polycarbonate panels that are a mix of clear and milky-white, making a variety of lighting combinations available to the grower. The project has been generating interest from as far afield as Liverpool, England, and a local university here is trying to raise money to do a similar project. Tim feels it would be pretty easy to replicate and do a second generation, possibly making a few changes and tailoring it to the needs of a specific user. 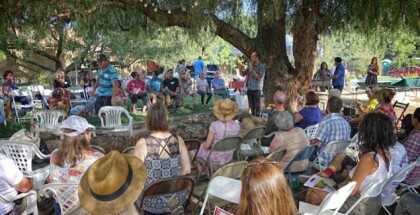 He hopes the mobile greenhouse will offer some solutions to urban farming, or at least start a discussion about generating more grassroots innovation in terms of facilities that support urban farming.